Social media insurance. In September 2013, Nationwide Insurance reached a major milestone with 100k twitter followers for their Nascar Nationwide twitter account. 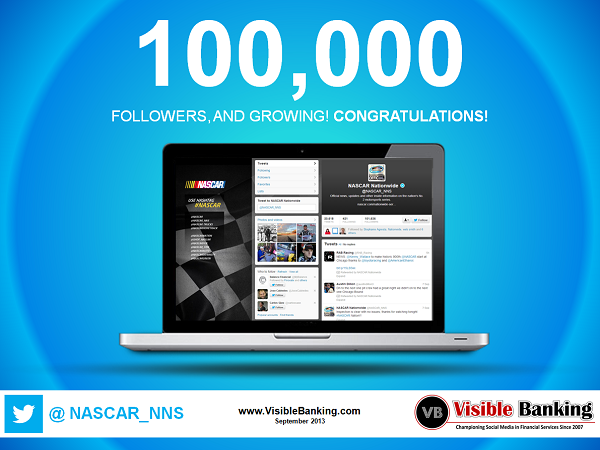 Congratulations to Nationwide insurance (@NASCAR_NNS) for recently reaching no less than 100,000 twitter followers! It positions their account at #22 in the world (financial services), #2 in the world (insurance) and #8 in North America. In August, the twitter team at Nascar Nationwide tweeted a bit more than 20 times a day on average. As usual, I invite you to share your comments and your questions on Nationwide Insurance’s major 100,000 twitter followers milestone, and also your best practices on twitter and social media in financial services here or on twitter.